I do love it when a plan comes together. Yesterday was the last day of the Sitting Pretty Mystery Class. 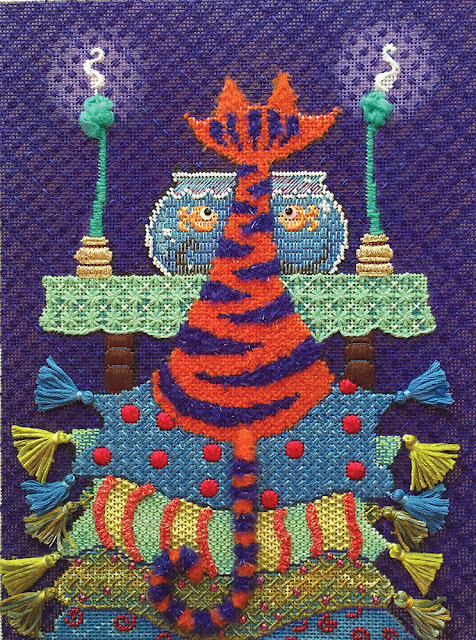 We had background to stitch, the fishbowl and the tassels. The most exciting part for me was the background. I designed a new stitch which was a bit of a challenge but looks oh so pretty and I was able to launch a brand new thread that I am manufacturing! Woo Hoo! We all love a new thread, right? Before you get too excited. This is so new that I have one color so far. I hope to have an assortment of colors by Fall but manufacturing is manufacturing and there are always twists and turns. I am overdying Floche! You know I love Floche and I love overdyes. So what better match. It’s yummy to stitch with and the colors dye beautifully. More about the thread soon when I have more colors to share. This is just a little preview to my wonderful stitching friends who allow me to share my love of stitching with them through the Mystery Classes. Here’s our new background Darning Pattern. It is worked in two directions on the diagonal. Now, you know why we didn’t do the background first. 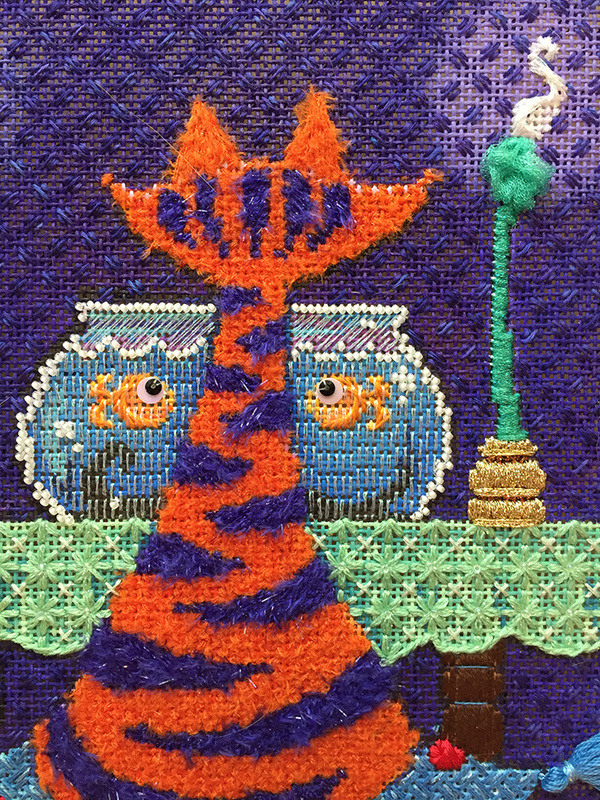 I was waiting for the dye to set 🙂 Because this stitch is worked entirely on the diagonal I did give you a second choice for the background. You may not love counting as much as I do. Who really does love counting and compensating as much as I do? This is a two-way Darning Pattern so you stitch all the diagonals in one direction first and then stitch the other direction. Darning Patterns are great fun in that they are really just weaving. Over 2 threads, under 1 thread, over 2 threads, under 1 thread and so on. There is one important thing to think about when working a darning pattern. The threads on the back of the canvas will show through and are important to the design. They create shadows and tones that we want to see from the front. 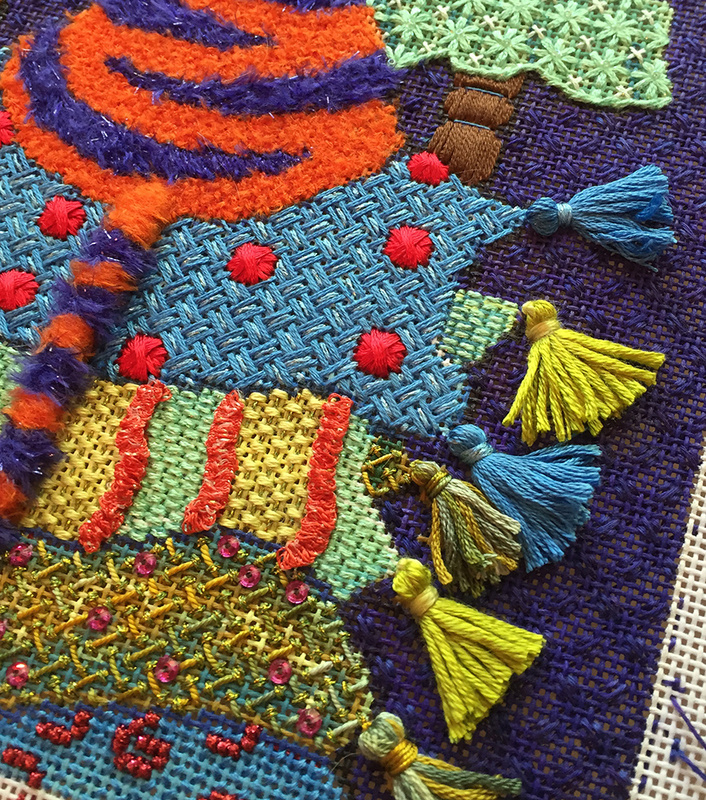 So, to have the prettiest finished piece it is important that you finish every row. As you are working you will find you finish a row and you are two canvas threads from the end and you want to turn around and head in the other direction. Don’t do it yet! 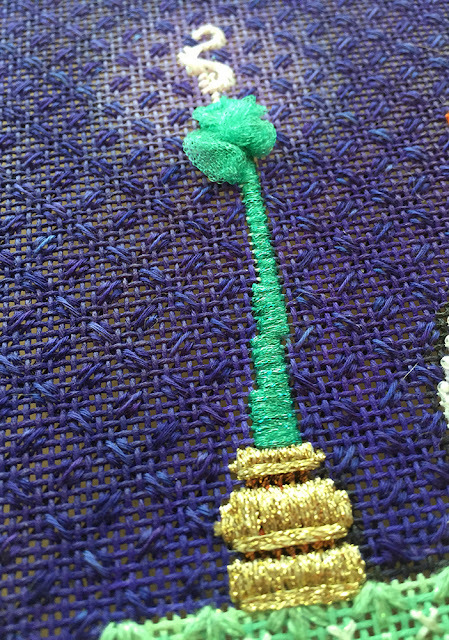 Continue out into the border, take another stitch and then turn around and stitch in the opposite direction. This continues the shadows behind the piece all the way to the edge keeping everything consistent. Our fishbowl is finished. I did a fishbowl last year on the Bohemian Beauty canvas so we needed a different choice this time. The entire bowl is simply stitched in a Long Stitch pattern of accentuate. It shimmers like water behind glass and it’s oh so easy. Last but not least were the tassels. Fun and easy to make with big big impact! We have more canvases arriving this week so if you would like to stitch your own kitty, give us a call or order online. We’ll pack it and send it winging its way to you. All the ladies in class said this was the most fun piece ever! They would know wouldn’t they? 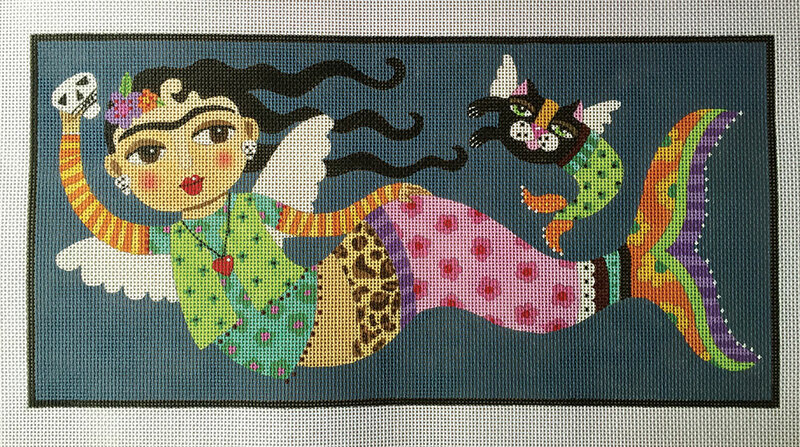 In less than 2 weeks we start the next mystery class Lulu’s La Sirena. 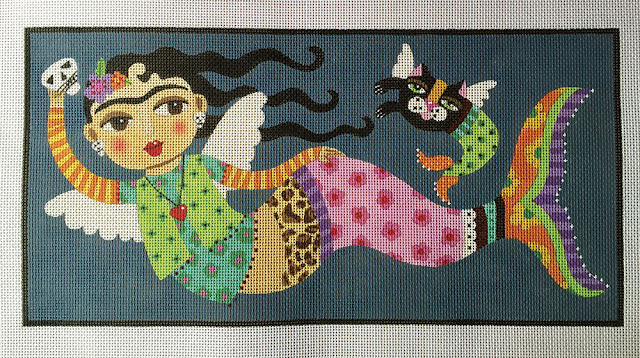 A Frida Kahlo inspired mermaid with her mer-cat. What a fun summertime piece. It’s not too late to join the fun. You can signup online or by calling us at410.296.0405. Remember if you are taking a mystery class and happen to find yourself in town, you can always join the fun. Janet was here yesterday for class and quickly got adopted into the silliness that is a class of mine. Thanks for coming Janet it was a real treat. « Previous: Can a Lamp Change Your Life? I signed up for the next mystery – I cannot wait to start!! SO FUN!! Hi Christine – So excited you are going to take the next class. Hope you will come visit soon. We miss you.